Hi Fern, signing in – by the way the title is not referring to my teeth but to Nao’s! 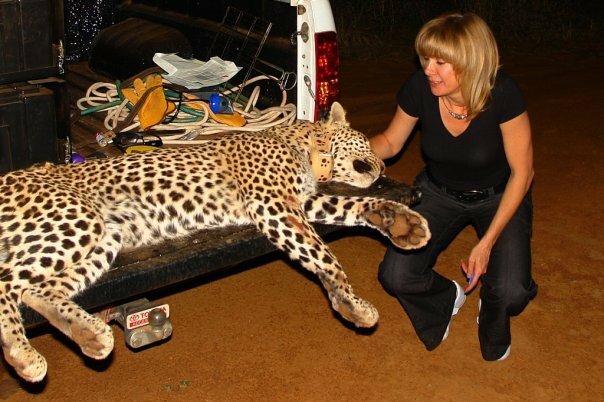 Just received a slap from her – not hers either but the teeth of a beautiful leopard. 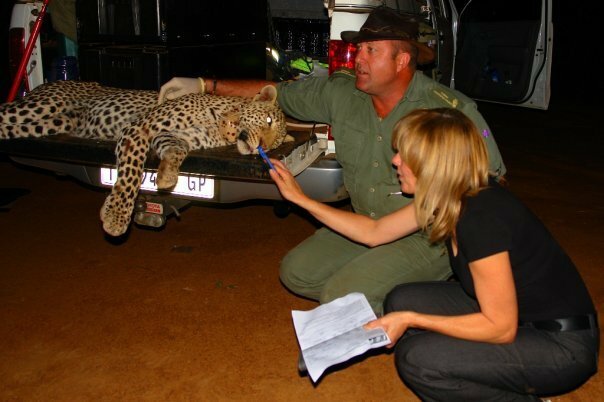 Dad sent an email with photo’s of a leopard that they had sedated, put a collar on and measured, including his teeth – wouldn’t like to be his lunch!! Everything is going fine at school, working hard as usual. Nao has a bad cold and is extremely grumpy so after this blog I’m going to take a walk in the lovely sunshine and let her suffer on her own. Hopefully she’ll be asleep when I get back. she is the pretty blonde lady! Dad said Philemon is busy and that the fishing is going well. Mama Joyce is keeping everyone behaving with her weapon of choice, her rolling pin! To all of you that don’t know Mama, she is amazing but oh boy, what a temper! She however, only brandishes her weapon furiously above her head as she chases the offending culprit but has, as yet, to use it! Anyway, back to the leopard. As you will see from the photo’s, he is beautiful and healthy. He has been extremely elusive and it was by chance that Moses, our bushman tracker, spotted him the other day. Everyone got moving quickly and were able to dart him, measure and record all details etc. without any incident. Enjoy the photo’s, until next time, Fern signing out! GREAT REVIEW! I pretty much agree with all you said in your article, especially at the beggining of your article. Thank you, your post is very useful as always. Keep up the good work! 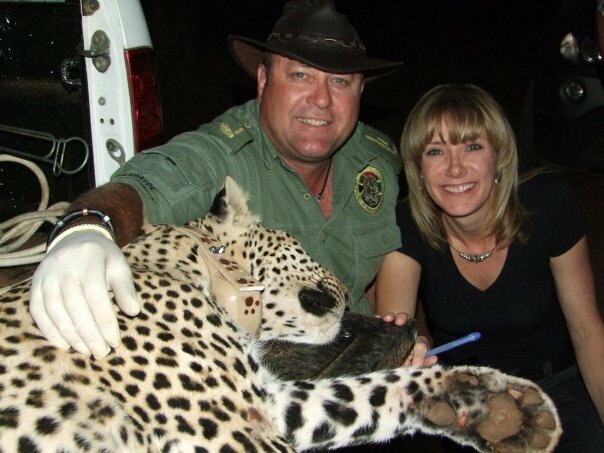 You’ve got +1 more reader of your web blog:) Isabella S.
hiya, i’m from aussie, love blog and photos of animals, leopard is just absolutely beautiful! so enjoy all the blogs and love the website. Looking forward to more. 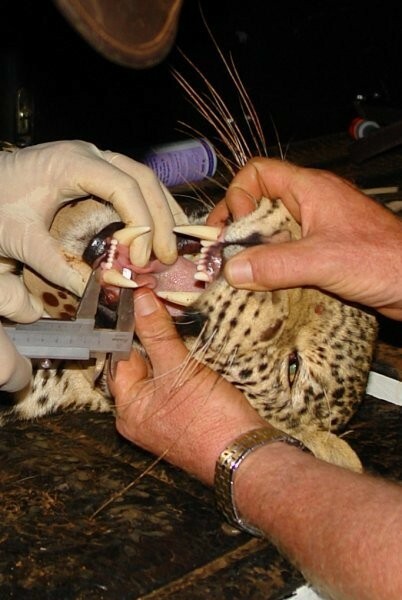 Leopard is stunning and those teeth, i’d also run!!!!!!!!!!!!!!!!!!!!!!!! Enjoying the blogs, found the blog on internet, want to buy the book, where do i get it?